I just wanted to share some pictures with you of a recent fishing excursion. 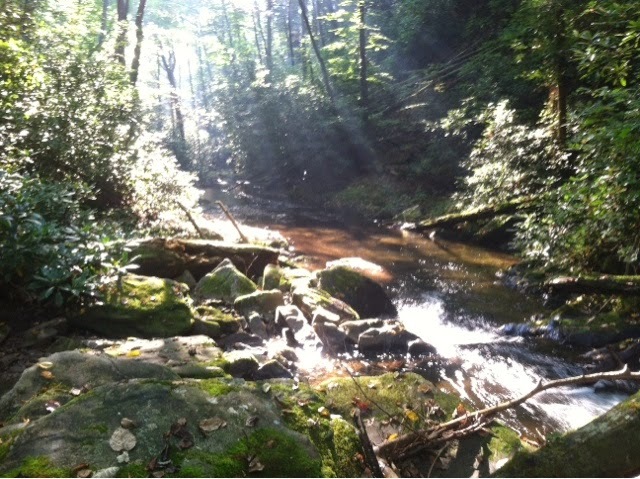 I had read online that most people fish Duke's Creek inside the Smithgall Woods boundaries, which means private, trophy managed waters and very smart/picky trout, but there are very nice, native fish to be found between the boundary and the Duke's Creek waterfalls. When it comes to trout fishing, I'm still very much a beginner. 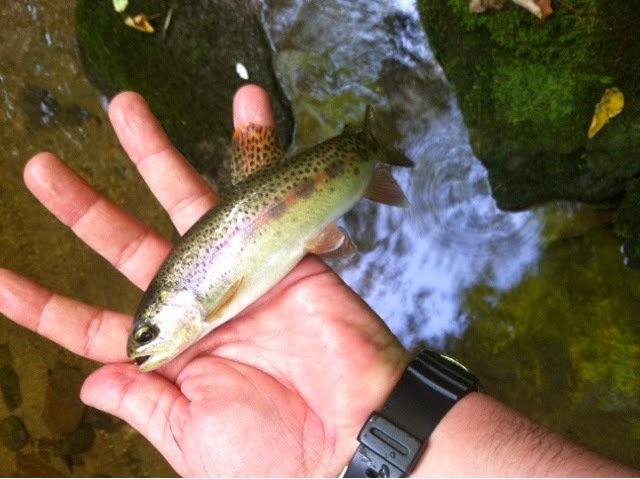 There is something very special about being alone in a tiny mountain creek stalking these beautiful fish. With my trusty TFO 2 weight in hand, I set out. I was in the water just after sunrise and fished steady until just after noon. I managed lots of strikes, and hooked up a few times, but I was only able to land one, a gorgeous native rainbow trout about 8"-9" long. That one fish made the whole trip worthwhile, and it's my largest trout to date. I had an absolute ball fishing Duke's Creek, but I wouldn't recommend it. The terrain and hiking in and out of the canyon makes it very dangerous. 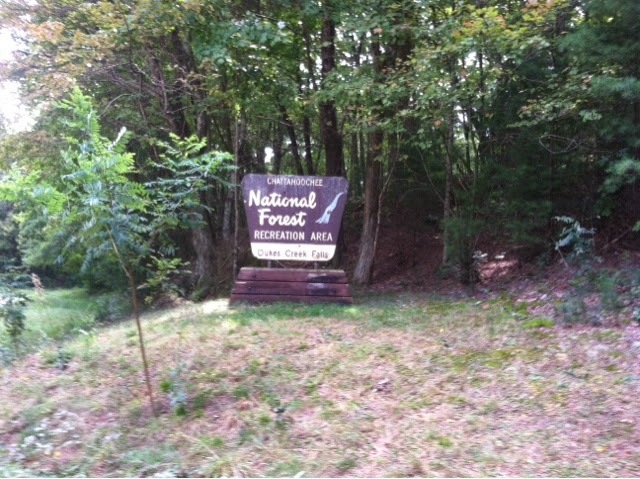 There are far easier places to fish in North Georgia and you will probably be more successful. I'm glad I fished it. I feel a bit redeemed, after being skunked twice in Smithgall Woods I finally pulled a trout out of Duke's, but I won't be fishing this stretch again. Go for the beauty of the falls, but find another spot to fish! Tight lines and easy trails! The sign marking the Falls' parking area. 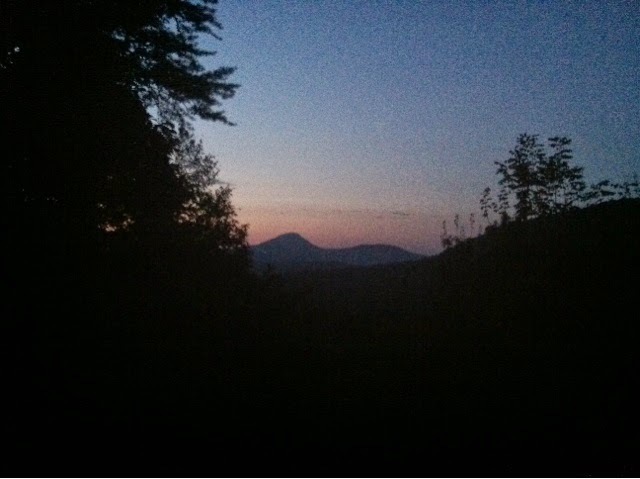 That's Mount Yonah (or Yonah Mountain) in the distance, just as the sun was starting to come up. 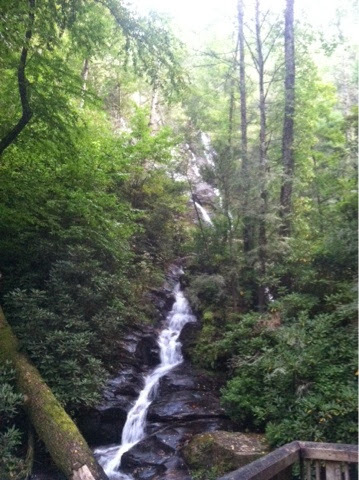 One of the waterfalls on Duke's Creek as seen from the lower viewing platform. 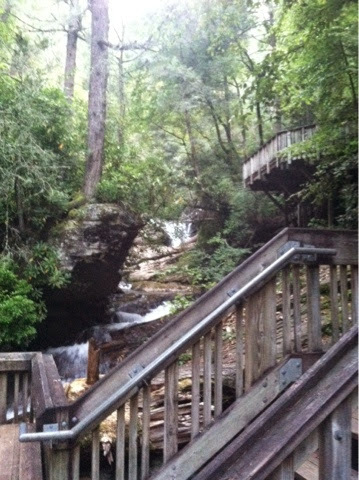 The upper viewing platform with the other waterfall beyond it. 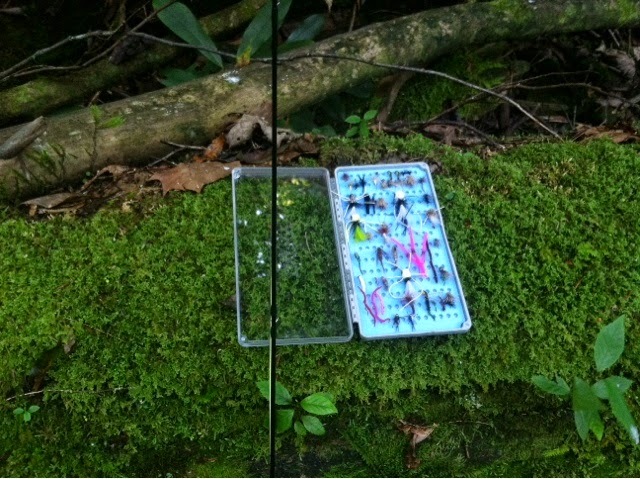 Taking some photos of my Tacky Fly Box for an upcoming product review. Gotta love moss covered logs, right? 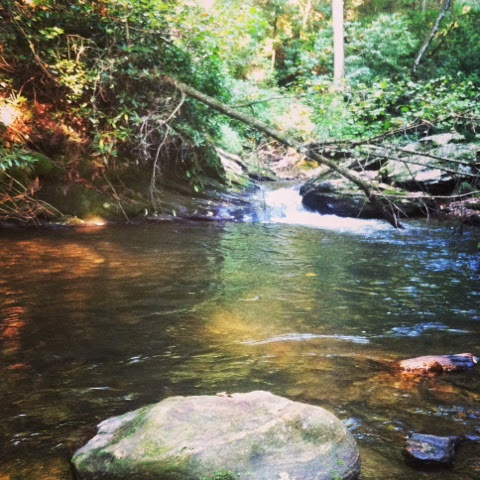 One of the gorgeous little pools on Duke's Creek. I got several strikes here, but just couldn't get them to hand. It's definitely a scenic area. There's lots of tumbling water and little pools. The sun coming through the trees is quite striking as well. There he his in all his natural, native color! I caught him on a rusty brown colored bead head wooly bugger. I need to find a better way of taking fish pictures when I'm alone, any advice? 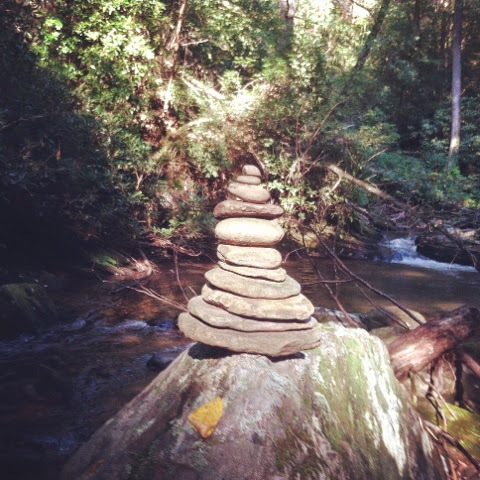 I actually saw several of these cairns on the creek. Apparently I wasn't the first person to fish here! This is where I decided to leave. 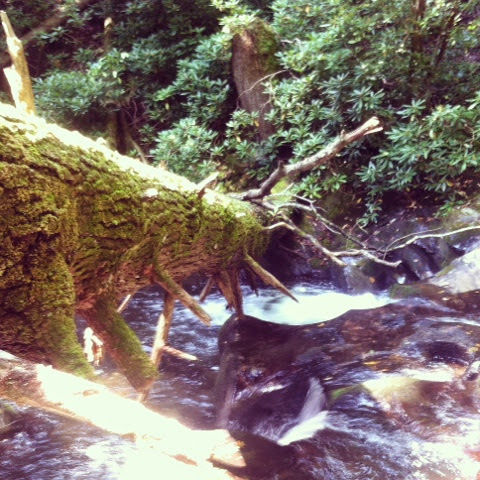 The creek drops about 8' below that log and it's almost shear canyon wall on both sides. I had to backtrack a ways to get up out of the water. 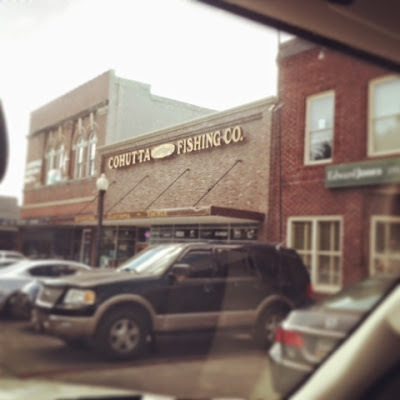 Ran up to Cartersville the day before to check out the Cohutta Fishing Co. and pick up a new fly line and some flies. They've got an awesome store with a ton of gear. Check them out if you're in the area!